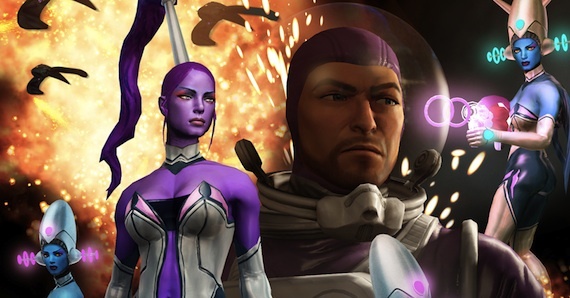 One of the games that I have been looking to pick up for quite a while now is Saints Row the Third. Word has been that it's a completely crazy off the wall wacky game, and that is something that is very much up my alley. So during the recently concluded Steam Fall Sale I finally picked it up, and I've been playing it quite a bit over the past few days. Today I wanted talk a bit about some of the little things I've found that the game does well. I feel I should point out that this is not a review, a comparison or anything else. The short story is that I find the game to be quite enjoyable. I really don't have the depth of experience with sandboxey games to say these are things other games do not do, though. I simply want to talk about some of the little things Saints Row the Third does that are subtle, but great. The first thing that comes to mind is simply the way the game's world changes as you progress through the game. I feel like a lot of sandbox games in the past have struggled, or perhaps simply not cared, about this, which is very sad. I was really amused by the way the graffiti, propaganda and townspeople changed in inFamous based on your alignment, but those are very simple things. Saints Row does a few things of it's own. For one, it has the radio. Like many similar games you can listen to the radio when in the car. Occasionally a newscast will come on describing recent happenings. Namely, what happened in your last story mission. It's fun to get that feedback and see the public's perspective on you blowing up that building or what have you. On the topic of the radio, you also have recognizable names as you meet new people throughout the story. Perhaps you'll meet a person and then radio shows will start talking about them. Heck, maybe that person calls into one of the radio shows. Additionally, you have unlocks. Completing several of the game's missions will unlock vehicles, outfits for you and your crew, people who can join your crew, etc. I find it pretty cool to say, complete the "Gangstas in Space" missions, and then have the ability to fly around in a space ship whenever I want. Or to see people dressed as aliens walking around the streets intermixed with the random townspeople. Heck, I have aliens in my crew that show up whenever I start a fight. I could dress up as an alien if I wanted to. All of this stuff is, as I said, very subtle little stuff. However with all of it combined I get this feeling that the world is changing based on what I'm doing. The world feels alive rather than a shell full of points to visit like in other similar games. I think the biggest thing the game does to pull you in though, is it's "Respect" system. Essentially, respect acts something like experience. As you complete missions and perform various tasks, you earn respect. As your respect level rises you unlock the ability to purchase various upgrades. These upgrades are pretty much all quite good. The genius of the system is in how respect is awarded though. Basically, everything you do earns you respect. You get respect for killing enemies. You get respect for getting headshots. You get respect for blowing up vehicles. You get respect for stealing cars. You get respect for driving in the oncoming lane. You get respect for streaking. What's more, pretty much everything you earn respect for also has a challenge associated with it. If you do said thing x number of times (ie. score 500 headshots), you complete the challenge rewarding you more respect, money, and often times an achievement. This system is great on a handful of different levels. First off, it incentivizes doing pretty much anything you want to do. It's a lot more fun killing bad guys if you are getting respect for doing it. Especially if it's filling up a challenge bar. What's more, it encourages the player to find crazy new ways to do things. I get extra points if I kill him with a shot to the crotch? What other wacky things do I get points for!? The game is supposed to be crazy, and the game reinforces that by encouraging the player to do crazy things, with respect. Buy lots of ridiculous outfits! Drive against traffic! Kill dudes with a blinged out shotgun! Run people over! On top of that, executing any of these things several times in quick succession has a multiplier effect. Headshotting 5 guys in a row is worth more respect than headshotting 5 guys over a 5 minute period, adding a level of intensity to the game. I think the best part of all of this is just that it adds that extra level of gameyness to everything you do. A lot of these types of games can suffer from monotonous travel time from one place to another. In Saints Row the Third however, traveling any distance is usually pretty fun. I know whenever I want to go anywhere, I always make a point of driving in the opposite lane or streaking. These are challenges that have at least some measure of skill and also offer some amount of reward. This makes just moving from point A to B, the most mundane part of pretty much any game, fun and rewarding. Basically the game seems like it tries really hard to make every moment as fun and worthwhile as possible, and I would say it does a pretty good job. It may not be a 100 hour behemoth like other sandbox games, but it's a much denser ~45 hour one (if we are talking about 100% completion). Which you prefer is a matter of preference, but I would personally take 45 hours of awesome over 45 hours of awesome, 45 hours of mediocre and 10 hours of driving in straight line. 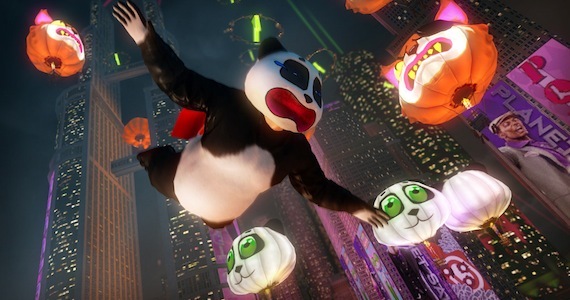 A lot of people look at Saints Row and see an over the top zany game and things that's crazy fun. They aren't wrong, but I believe that appeal only lasts for so long. Without the little aspects of gameplay keeping you immersed in the game I don't think it would be as successful. That's really the appeal of a sandbox anyways. You always want to keep going, to complete one more quest, grab one more collectible. 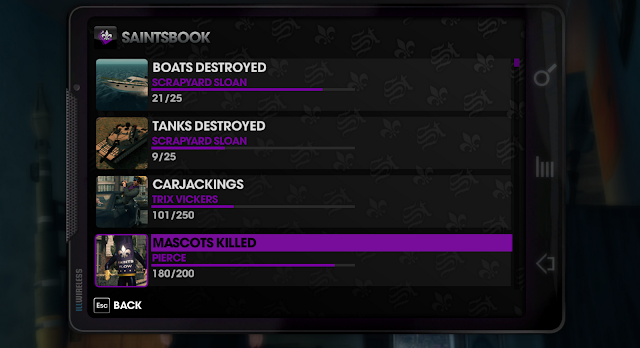 The difference with Saints Row is that it's not just the objectives the game spells out. You can basically do anything you want for as long as you want, and there will be some level of reward there to make the time worth while. It's music is pretty awesome too.